"AFOS" redirects here. For ankle-foot orthotics, see Orthotics. For AFOs as a plural, see AFO (disambiguation). This article is about the British new wave band. For the band's self-titled debut album, see A Flock of Seagulls (album). A Flock of Seagulls was started by Mike Score in 1980 in Liverpool. The band's name was taken from The Stranglers song "Toiler on the Sea" and the book Jonathan Livingston Seagull, according to Mike Score. The inaugural line-up of the band featured Mike, who was previously a hairdresser, on lead vocals and keyboards, Ali Score on drums, and Frank Maudsley on bass. The band added Willie Woo on guitar; and then brought in Mark Edmondson to replace Ali on drums when the Score brothers had a falling-out. Not long afterwards, Edmondson departed to make way for a returning Ali; and shortly thereafter Woo departed the band and was replaced by teenager Paul Reynolds (of the band Cindysbeentrippin), who had been a close friend of Edmondson, at the behest of Maudsley; thus creating the band's classic line-up. After practising above Score's hair salon, the band started playing clubs and eventually got a recording contract. They recorded radio sessions for John Peel's Radio 1 on 6 May 1981, which aired six days later. Eventually, under the management of Harry Maguire, Tommy Crossan and Mick Rossi all directors of Checkmount Limited, they began to release singles through Jive Records. The group released their debut single 'Talking' (produced by Nelson), on Bill Nelson's Cocteau label. They were then signed to major label Jive, distributed through CBS records, where they released their second single 'Telecommunication'. The single was also produced by Nelson and became a club hit. Their third release was the EP 'Modern Love is Automatic'. Originally released as a 4 track EP on both 7" and 12", the 12" edition was soon reissued adding 'Telecommunication'. This 5 track EP was also their first release in the U.S. In 1982, the group's fourth single 'I Ran (So Far Away)', produced by Mike Howlett, the former bass player of the band Gong, became a worldwide hit, reaching number 1 in Australia and the Top 10 in both the US and New Zealand. Their debut album and single 'Space Age Love Song' were both successful. In late 1982, the band finally found major success in their home country with 'Wishing (If I Had a Photograph of You)', the first single from their next album Listen, which reached the Top 10. Later, the band was praised for having broken the ground for other musical acts during the advent of the video music area, but as it turned out, 1982 was the peak year of their commercial and critical success. On Memorial Day Weekend, Saturday, 28 May 1983, A Flock of Seagulls performed at the US Festival along with Oingo Boingo, Men at Work, and others. Three more singles were released from Listen in 1983, including a re-recorded version of their debut single '(It's Not Me) Talking', but they were only minor successes in the UK and abroad. Faced with disappointment, the group changed direction from their Science Fiction themes and produced a more conceptual emotion based third album in 1984 called The Story of a Young Heart, with 'The More You Live, the More You Love' as the lead single. Despite heavy rotation on MTV and other music video shows at that time, the single was only moderately successful, but the album's other two singles – 'Never Again (The Dancer)' and 'Remember David' (released only in a few European countries) – did not make any headway. Faced with sliding sales and a loss of direction, the band continued to consider their options whilst touring. During this period, Paul Reynolds left the band, and was replaced by Gary Steadman; with the band bringing in keyboardist Chris Chryssaphis at the same time to augment their sound. Both would stay in the band for the sessions during which their next album, Dream Come True (released in 1985 in the UK and 1986 in the USA), would be recorded, but would depart thereafter. Brothers Mike and Ali Score decided that they wanted to base the band out of Philadelphia, Pennsylvania. With past success in the US, both brothers thought leaving the UK and a new life in America was a perfect solution. With the popularity of the first two albums and the name "A Flock of Seagulls" still having some equity, they had 4 straight sell-out shows in Philadelphia. Mike, Ali and Maudsley all applied for and were conditionally awarded green cards based on celebrity status under the O-1 work visa. The conditional approval was granted to all three, who settled in Philadelphia. However, shortly after moving to the states, and whilst recording Dream Come True, Maudsley became disillusioned with living in a strange city; he had no family in the USA. Missing the UK, he ultimately returned to England following the completion of the album. Mike and Ali stayed in Philadelphia and satisfied the terms of the visa. With Frank in Britain and the brothers in the USA the band appeared to be splitting into two camps; whereas in fact, it was actually Frank Maudsley who kept the band communicating. Ultimately, the brothers had another falling-out which resulted in the band dissolving in 1986, shortly after the U.S. release of Dream Come True. The band's line-up had a complete modification in 1988 in Philadelphia with a line-up composed by Mike Score of himself along with numerous local musicians; consisting of guitarists Ed Berner and Dave Maerz, bass guitarist, Mike Radcliffe, keyboardist Mike Railton, and drummers' Kaya Pryor and Jonte Wilkins. This line-up expanded the following year to include drummer Mike Marquart; but was then reduced to a five-piece band consisting of Score, Berner, Pryor, Radcliffe, and Railton; and it was this line-up which released the single "Magic" that same year. In 1994, the band's line-up changed again; this time to a formation consisting of Score, Berner, and new recruits A.J. Mazzetti (drums) and Dean Pichette (bass guitar). This line-up recorded the album The Light at the End of the World in 1996, but it failed to chart. In 1998, Berner, Mazzetti, and Pichette departed the band and were replaced by Joe Rodriguez, Darryl Sons, and Rob Wright respectively. In 1999, the band re-recorded the Madonna song "This Used to Be My Playground" for the 2000 Madonna tribute album The World's Greatest 80s Tribute to Madonna. In November 2003, the original line-up of Mike and Ali Score, Paul Reynolds and Frank Maudsley reunited for a one-off performance on the VH1 series Bands Reunited. In September 2004, they reformed again and did a brief tour in the United States. Though the tour continued to be advertised as the "original lineup", later shows no longer included the original band, but was Mike Score's continuation of the newer band; which by this point consisted of Score, Rodriguez, and new recruits Michael Brahm (drums), and Pando (bass guitar). In 2005, this version of the group starred in the American version of the entertainment show Hit Me Baby, One More Time, where they performed "I Ran" and a cover of Ryan Cabrera's song, "On The Way Down" for a chance to have $20,000 donated to a charity of their choice. In June 2011, former members Frank Maudsley and Paul Reynolds performed at Croxteth Park music festival, Liverpool, under the name 'A Flock of Seagulls'. On 4 February 2013, Mike Score indicated via his YouTube account that he was pursuing his solo career. He released the singles "All I Wanna Do" in February 2013, and "Somebody Like You" in January 2014. 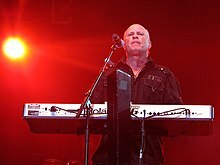 In late July 2013, after a Southern California performance, Mike Score told the Los Angeles Daily News that the band's rented van that contained $70,000 of equipment and the hard drives that stored tracks for his solo album Zeebratta were stolen from a Comfort Inn. While this delayed the album's release, he was able to reconstruct it with music files from his home in Florida. Zeebratta was finally released on 1 March 2014. Kevin Rankin replaced Brahm on drums in 2016, and Gordon Deppe replaced Joe Rodriguez in December 2017. On 3 May 2018, it was announced that the band's original four members would reunite once again to record a new album titled Ascension, their first studio recording since 1984. Featuring the Prague Philharmonic Orchestra, it will be a 10-track album composed of unique renditions of their previous hits and one new song. The music video for "Space Age Love Song" premiered on YouTube on 6 June, and a 5-track EP which features five versions of the song was released digitally two days later. The album was released digitally and in physical stores on 6 July, but physical copies were available online two weeks prior. Due to their memorable and unusual style and appearance, A Flock of Seagulls are sometimes referred to with ironic appreciation. The New Musical Express wrote: "Of course, everyone remembers this group now for singer Mike Score's ridiculous back-combed haircut and the fact that they are mentioned in Pulp Fiction. So now they're kind of cool, but in the early 1980s it was a different story." Additionally, the band was featured on Viacom's VH1 and Sony's BMG Legacy Recordings' 2006 revival CD series and multi-platform marketing campaign, "We Are the '80s". In a 2007 article for The Guardian, Alfred Hickling described the group as "dreadful", and unfavourably compared them to Liverpool new wave peers OMD and other acts of the time. Their dramatic style has drawn much criticism and parody, but the band has also been recognized as a pioneering act, capturing the spirit of their time, particularly with the guitar work of Paul Reynolds and sonically multi-layered hits such as "Space Age Love Song," "Telecommunication," and "Modern Love Is Automatic." The band also is noted for creating a successful concept album, their debut, which alludes to an alien invasion of earth. Billboard writer Robert Christgau applauded their "mechanical lyrics, about a mechanical end of the world," while noting the "aural pleasure" of both the band's debut album and the follow-up. The album track, "D.N.A." from A Flock of Seagulls, won a Grammy Award in 1983 for Best Rock Instrumental Performance. ^ a b c d Erlewine, Stephen Thomas. "A Flock of Seagulls – Artist Biography". AllMusic. Retrieved 27 August 2014. ^ a b Larkin, Colin (2011). "A Flock of Seagulls". Encyclopedia of Popular Music (5th ed.). Omnibus Press. ISBN 0-85-712595-8. ^ Bird Jr., Walter (26 April 2017). "Mike Score still flying with Flock of Seagulls". Worcester Magazine. Retrieved 6 June 2018. ^ "A Flock of Seagulls – Biography". Amoeba Music. Retrieved 15 June 2016. ^ a b Thompson, Dave (2000). Alternative Rock. Hal Leonard Corporation. pp. 141–42. ISBN 978-0-8793-0607-6. ^ "BBC – Radio 1 – Keeping It Peel – 06/05/1980 A Flock of Seagulls". BBC Radio 1. Retrieved 12 June 2018. ^ Greene, Andy (8 August 2012). "Where Are They Now? 1982's Biggest Pop Acts – A Flock of Seagulls". Rolling Stone. Retrieved 22 March 2015. ^ "A Flock of Seagulls". Official Charts Company. Retrieved 6 November 2013. ^ Cross, Charles R. (30 August 2001). "Never mind the hair bands, here's a Flock of Seagulls!". Salon. Retrieved 6 November 2013. ^ Wener, Ben (31 August 2012). "The Forgotten Festival: Remembering US '82 and '83 as Steve Wozniak's dream bash turns 30". Orange County Register. Retrieved 7 June 2018. ^ Takiff, Jonathan (18 November 1988). "Local Seagulls Join The Flock". Philadelphia Daily News. Retrieved 15 June 2016. ^ Strong, Martin C. "A Flock of Seagulls". Retrieved 15 June 2016. ^ Venable, Malcolm (13 October 2009). "Low-key musician doesn't need to be a big rock star". The Virginian-Pilot. Retrieved 15 June 2016. ^ Waller, Paul (24 January 2013). "Flock-of-Seagulls/Mike-Score". Penny Black Music. Retrieved 7 June 2018. ^ "A Flock of Seagulls' Mike Score Releases New Single 'Somebody Like You'". Broadway Worldwide. 29 January 2014. Retrieved 12 June 2018. ^ Associated Press (23 July 2013). "Flock of Seagulls Tour Van Stolen With Instruments, New Album Inside". Billboard. Retrieved 7 June 2018. ^ Cummings-Grady, Mackenzie (3 May 2018). "A Flock of Seagulls Announces New Album 'Ascension'". Billboard. Retrieved 27 May 2018. ^ Staff (7 May 2018). "Fully Reunited, A Flock of Seagulls Readying New LP 'Ascension,' with the Prague Philharmonic Orchestra". Rock Cellar Magazine. Retrieved 2 June 2018. ^ "Magnet Exclusive: Premiere of A Flock of Seagulls' "Space Age Love Song" Video". Magnet. 6 June 2018. Retrieved 7 June 2018. ^ Gray, Julia (7 June 2018). "A Flock Of Seagulls' Original Lineup Remade Their Best Song for First Recording in 34 Years". Stereogum. Retrieved 8 June 2018. ^ "A Flock of Seagulls – Ascension". AllMusic. Retrieved 8 July 2018. ^ Paoletta, Michael (22 July 2006). "Making The Brand: An '80s Revival". Billboard. Vol. 118 no. 29. p. 13. ISSN 0006-2510. ^ Hickling, Alfred (19 March 2007). "The Electric Hills". The Guardian. Retrieved 5 November 2013. ^ Carpenter, Megan M. (2010). "Space Age Love Song: The Mix Tape in a Digital Universe". Works.bepress.com. Retrieved 6 November 2013. ^ Duxbury, Janell R. (1988). Shakespeare Meets the Backbeat: Literary Allusion in Rock Music. Taylor & Francis. ^ Christgau, Robert (30 November 1982). "A Flock of Seagulls". The Village Voice. Christgau's Consumer Guide. Retrieved 6 August 2014. ^ Christgau, Robert (26 July 1983). "A Flock of Seagulls: Listen". The Village Voice. Christgau's Consumer Guide. Retrieved 6 August 2014. ^ Cohen, Sara & Strachan, Robert (2005). Oswalt, Philipp (ed.). Music Cultures and the Appropriation of Urban Space (PDF). 1: International Research. Ostfildern-Ruit, Germany: Shrinking Cities. p. 398. ISBN 3-7757-1682-3. Retrieved 6 August 2005. ^ Janosik, MaryAnn (2006). The Greenwood Encyclopedia of Rock History: The video generation, 1981-1990. Greenwood Press. ISBN 978-0-3133-2943-2. ^ "A Flock of Seagulls – Awards". Allmusic. All Media Network. Retrieved 6 November 2013.